Each new print copy includes Navigate 2 Advantage Access that unlocks a comprehensive and interactive eBook, student practice activities and assessments, a full suite of instructor resources, and learning analytics reporting tools. 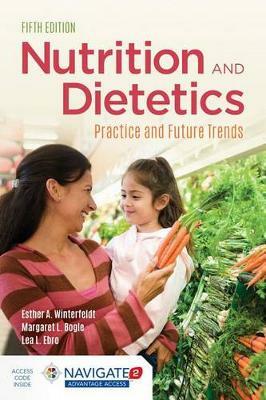 Nutrition and Dietetics: Practice and Future Trends, Fifth Edition provides a comprehensive overview of the many professions relating to nutrition, with an emphasis on dietetics. It examines what dietitians do, the areas in which they practice, and the education and experiences needed to become a credentialed, fully prepared dietitian nutritionist and dietetic technician. Nutrition and Dietetics begins by presenting an overview of the profession, the role of the Academy of Nutrition and Dietetics, and the educational requirements for credentialing in Parts I and II. The text truly distinguishes itself in Part III, which uniquely cycles through each major area of practice: clinical practice, food and nutrition systems management, community nutrition, government and military services, consulting, and private practice. Parts IV and V then present the essential roles played by dietitians as leaders, educators, and researchers, and closes with a look into the future of the profession. New & Key Features of the Fifth Edition: - Includes a new Chapter 9, Dietitians in the Government and Military Services - Provides new Learning Objectives at the beginning of each chapter to help students grasp key concepts in the chapter - Provides the latest education standards, requirements, and credentialing in the field of dietetics - Explores current and future trends in the dietetics profession With Navigate 2, technology and content combine to expand the reach of your classroom. Whether you teach an online, hybrid, or traditional classroom-based course, Navigate 2 delivers unbeatable value. Experience Navigate 2 today at www.jblnavigate.com/2.